The Windows 10 Get Started app offers a short guided tour to Windows 10. It appeals mostly to the same people who enjoy reading book introductions: They set the mood for what’s coming. To open the app, click the Start button and click the Get Started icon from the Start menu. The app fills the screen, shown here. 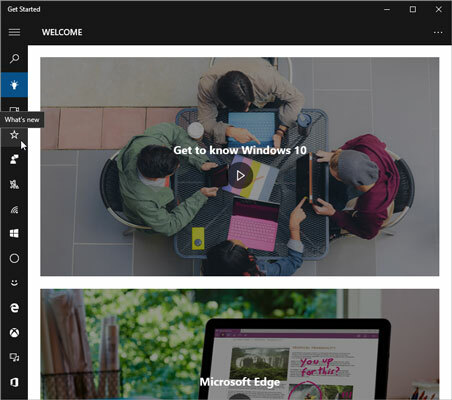 The new Get Started app offers a short introduction to Windows 10. Like most apps, the Get Started app lists icons along the left edge. Can’t see the icons’ labels? Then click the hamburger menu icon in the app’s upper‐left corner. Clicking that icon in any app expands the app’s left pane, letting you see labels next to the mysterious icons. You can also hover your mouse pointer over an icon and a pop-up reveals its name. Click the What’s New icon to see a quick explanation of the biggest changes in Windows 10. Feel free to click any of the other categories along the left and browse the offered options. However, the Get Started app serves as a very brief introductory guide to Windows 10. It’s definitely not a problem solver. In fact, the Get Started app has its own problem: Many portions work only when you’re connected to the Internet. If you’re not connected, the app simply displays an error message.